Its been over 100 years since the message, “Large gold discoveries in the Klondike!” went through the world press. This message drew tens of thousands of adventurers from around the world to Dawson City. The main access route to the Klondike gold fields was the Yukon River. This trip is ideal for people with little or no canoeing experience. Day 1: You will be picked up from the airport and brought into Whitehorse to your hotel. In the city we will watch a film about the Yukon at the Visitor Center. We will also visit the SS Klondike paddle wheeler and drive to the famous Miles Canyon on the Yukon River. We will then eat dinner together. Day 2: We will finish last minute errands and drive 180 km to the First Nation’s village of Carmacks. We will begin our paddling with 35 km on the Yukon River. Your experienced canoe guide will take you safely through the impressive "Five Finger Rapids". Day 3: We paddle to Minto. Along the way we will take a walk on hidden trails through the woods to visit an abandoned gold and copper mine. Day 4: We paddle 4 hours to reach Fort Selkirk, a well-preserved ‘museum’ village from the Gold Rush days. This historic location is accessible only by water. Day 5-8: We continue paddling down the Yukon River. As we continue our tour we’ll be fishing, baking bannock in camp and viewing wildlife along the river. Day 9: We often see black bears grazing the steep slopes along this section of the river. On the small islands in the river we typically see mother moose with their calves. Day 10: We have now paddled 400 kilometers and reach our destination Dawson City. We will spend the evening at the local casino ‘Diamond Tooth Gerties’ where we will watch a show put on by the lovely can-can dancers. The overnight will be in a hotel. Day 11: We will do some sightseeing in town and take a drive up the scenic "Midnight Dome" mountain. 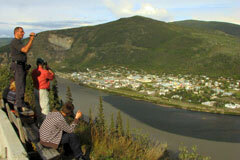 From here we are granted a splendid view of Dawson City and the Yukon River valley. We will then visit Bonanza Creek, as well as the huge gold digger dredge known as "Dredge # 4." The overnight will be in a hotel. 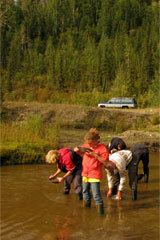 Day 12: We will pan for gold on Hunker Creek just as the gold seekers did 100 years ago. In the afternoon we willl drive on the Dempster Highway to Tombstone Mountain Territorial Park and stay at the local campsite. Day 13: We will take a hike in the Tombstone Mountains. From our vantage point we will have a magnificent view over the North Klondike River valley and the beginning of the tundra. That afternoon we’ll drive south to the Moose Creek Campground and spend the night there. Day 14: On the Klondike Highway we will drive back to Whitehorse. Dinner will be together and the overnight is at the hotel. We offer this tour upon your request for groups of 5 and more people. Prerequisites: This tour is very suitable for beginner canoeists. We recommend, however to acquire basic knowledge of canoeing on rivers beforehand. You should be in average physical condition as we are paddling up to 6 hours in the canoe and will take the occasional day hike.